Ghyslain Raza fighting like a Sith Warrior. In November of 2002, Ghyslain Raza a student that went to le Seminaire St-Joseph de Trois-Rivieres, Quebec, Canada decided to take advantage of his school’s recording studio. Imitating the Darth Maul character from Star Wars he jumped, danced and twirled around the studio using a tennis ball retriever in place of Darth Maul’s double-edged lightsaber. 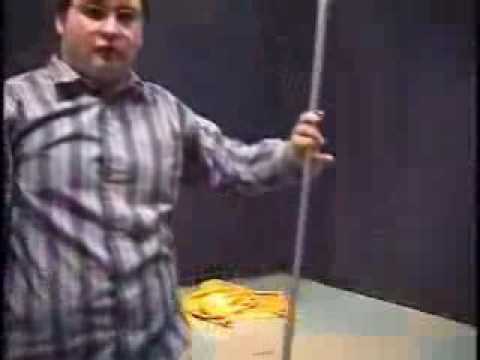 Chubby Ghyslain and his less than graceful moves were recorded and apparently forgotten for months. 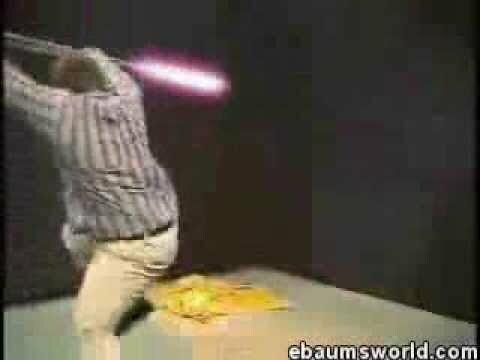 Then in April 2003, students at Ghyslain’s school (Michaël Caron, Jérôme Laflamme and Jean-Michel Rheault) found the recording and quickly began sharing it with their friends with the file name, ‘Jackass_starwars_funny.wmv’. It ended up on the p2p program Kazaa and weblogs started to host the video. Not long after, millions around the world were downloading and watching the video online. In Nov 2006 the Viral marketing company, The Viral Factory, collated page impression figures from websites such as YouTube and Google Videos. They determined that this video as of Nov 2006 had been viewed 900 million times the highest total at that time. The video first appeared on the Internet on the evening of April 14, 2003 but quickly spread the globe. The video was so popular and so widely circulated that sites hosting the video where recording millions of downloads. One website solely dedicated to the Star Wars Kid video recorded 76 million hits by October, 2004. The video itself might have died away but soon people where adding effects and editing the video to make new versions. Some special effects people like Bryan Dube, an employee from Raven Software added Star War’s effects, music and opening sequences. Several versions where made with various themes but the most well liked involved Star War effects, although a matrix version was heavily downloaded. The Star Wars Kid fame soon split over into merchandising and T-shirts, mugs and other paraphernalia that are still are available online. My name’s Jish and I am calling you from San Francisco, California and I’d like to interview you. Do you speak English too? Well, I’ll try to speak in French, but I’ll apologize in advance since my French isn’t perfect. The interview is concerning your martial arts video. Did you know that over 500,000 people have viewed your video? When you made the video, did you think this many people would be viewing it? No, I really never anticipated that. How did the video end up on the web? Actually, it was a mistake. The cassette was left in the studio and someone put it on the Internet. Then, I guess it wasn’t a friend who did this, more of an enemy? More or less. It was someone I knew. I only have a few more questions… There was something yellow on the floor in your video, what was that? It was probably something left behind in the studio from a previous session. I really don’t remember what it was. Some people have taken your video and have added some Star Wars special effects, have you seen these? Yes, I have seen some. What’s your opinion of these videos? From what I saw, they look very well-made. It’s surprising to see what people have done with a video that wasn’t meant to be seen. It’s interesting. I’m really into computers/computing, so my favourite sites are the ones from the different companies involved… Nothing that I visit regularly. 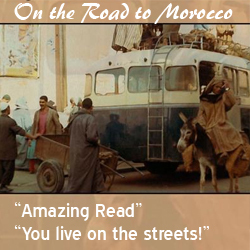 Do you also read weblogs? We know that you have a laptop, cell phone, Palm and other gadgets like that. Do you have any other favorite gadgets that you would like to buy, perhaps something like an iPod? For the moment, I don’t have plans to buy any gadgets, but sometime soon I’d like to get an iPod. Do you use a Mac or a PC? At home, I use a PC, but I really like the world of Macintosh. It’s what I use at school. If you bought an iPod, would you get the PC or Mac version? Probably, I’d get the PC version. Well, thank you very much and good night. The Raza family filed a lawsuit against four students who had encoded and spread the video (Charges where dropped against François Labarre because of lack of evidence). The lawsuit was finally scheduled to go to courts in April 2006 with the Raza family seeking $351,000 in damages. In 2006, days before the case was due to go in front of the judge, an out of court settlement was reached for an undisclosed amount, although some online sites quote the $US250,000 figure. The negative effects of the video’s popularity is cited as one of the reasons George Lucas, the Star Wars creator resisted a huge online petition to give Raza a bit part in the third and final installment of Star Wars. An online petition to do just that collected almost 150,000 signatures, which attracted the attention of mainstream media. In a BBC interview, Lucasfilm was quoted as saying “Obviously there has been a tremendous show of support for Ghyslain with tens of thousands of fans rallying around him … However, we are deeply saddened by the current situation and any difficulties this unwanted publicity might be causing him and his family.” Needless to say he didn’t get the part.